Rummage sales, city-wide in Janesville, every 3rd Saturday April through October. 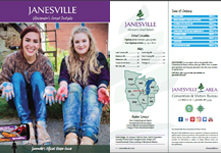 Check the local papers (Janesville Gazette, Shopper) for listings, both in print and online, as well as Craigslist. Many sales pop up without listings - watch for signs.